"Napoleon to Now: 1750 AD - Present". The set includes both the timeline and the figures! The wonderful timeline figures are printed on a premium cover stock, for durability. Also in the package are included the timelines pertinent to the period. They are printed on 11 x 17 cover stock and marked with century years and cutting lines, allowing them to be cut into 17" x 1" strips. There are also blank lines for extending centuries as needed. The timeline stock is a specific color, indicating the time period of each particular kit. The kit also includes tips for use and display and a handy reference sheet of the names and dates included in the particular set. The sets are reproducible (within a family), allowing them to be used in a variety of ways, from games and drills, to the ever-popular notebook timeline! The figures can accompany any chronologically-based curriculum, as well as unit studies of eras and general history studies. America's History: Explorers to 21st Century (Item #4426). From Homeschool in the Woods. "Napoleon to Now: 1750 AD - Present". The set includes both the timeline and the figures! 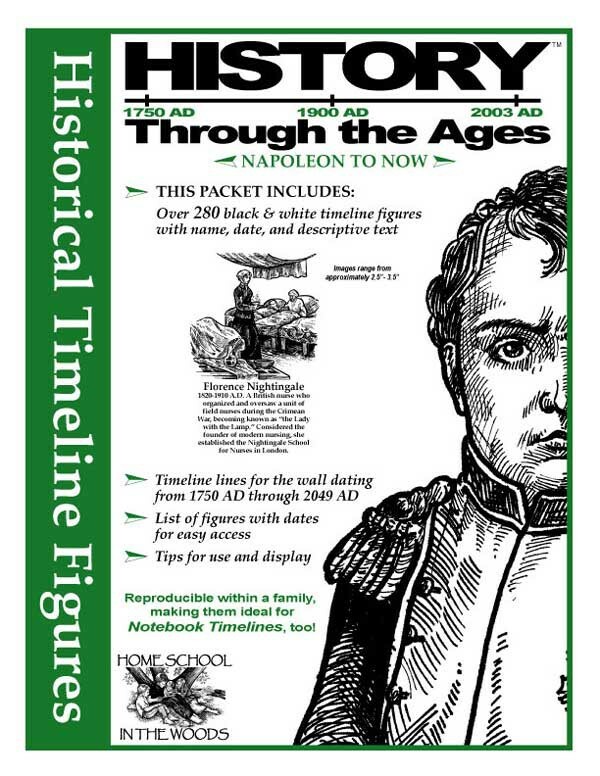 The wonderful timeline figures are printed on a premium cover stock, for durability. Also in the package are included the timelines pertinent to the period. They are printed on 11 x 17 cover stock and marked with century years and cutting lines, allowing them to be cut into 17" x 1" strips. There are also blank lines for extending centuries as needed. The timeline stock is a specific color, indicating the time period of each particular kit. The kit also includes tips for use and display and a handy reference sheet of the names and dates included in the particular set. The sets are reproducible (within a family), allowing them to be used in a variety of ways, from games and drills, to the ever-popular notebook timeline! The figures can accompany any chronologically-based curriculum, as well as unit studies of eras and general history studies. Additional Timeline sets available separately: Creation to Christ: Beginning to 1st Century (Item #5324) Resurrection to Revolution: 0-1799 AD (Item #5326 America's History: Explorers to 21st Century (Item #4426). From Homeschool in the Woods.